Not Street Fighter 2 Turbot? We've come to the horrible realisation that the fish playing Pokemon probably won't complete the game in its lifetime. Hell, at this rate it won't even make the first gym. 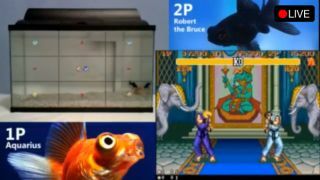 So inspired to create something a little more rousing, Andrew Hill has swooped in to make two fish batter one another on Street Fighter 2 for a Twitch audience. The first day saw Aquarius krilling it, swimming away with a 61-38 victory, but Robert the Bruce made a miraculous comeback yesterday, only two points down in a final score of 78-76. Today cod be his day. That's especially impressive given that Bruce just seems to hang in the same spot on the far right of the tank. Button bashers, eh? Hey Sony, this Gamescom teaser's a joke, right?